A reminder of how far I’ve come since bone cancer. 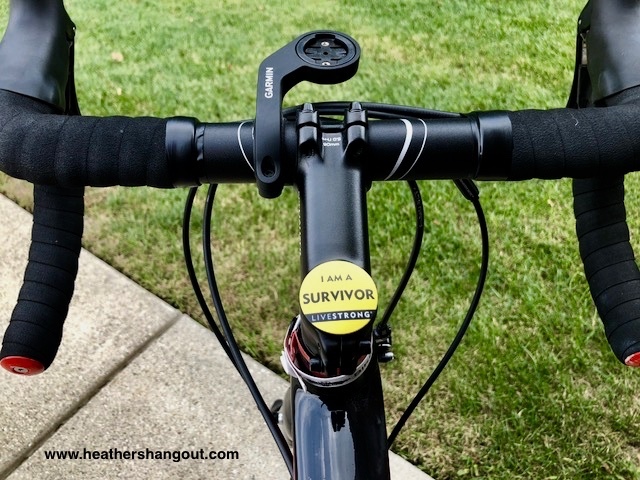 If you read my last post about lessons learned on RAGBRAI (the bike ride across Iowa that I recently did with Team LIVESTRONG), you’ll know why my road bike is so important to me. From the confidence to the health benefits to the freedom I feel, biking is important to me. As much as I love my bike, I love being a cancer advocate even more. So when I can put the two together, that’s amazing. I’m excited to share a new opportunity to add some fun to your bike and support LIVESTRONG’s programs and services for people facing cancer. One of my fellow LIVESTRONG Leaders is a very creative guy who worked with StemCaps to create custom caps for your bike’s headset. They created a collection of cool stem caps that support LIVESTRONG. Not only do these caps raise awareness of a great nonprofit, a portion of the sales are donated to LIVESTRONG – $5 from each LIVESTRONG cap ($7 for the personalized caps) will be donated to LIVESTRONG. You can customize some of the stem caps for someone special with “In honor of” or “In memory of” cap. There is also a survivor cap (see pictures here). You can add a name to the custom caps, or just order generic as you’ll see I did with the survivor cap. I also love the Team LIVESTRONG and “This fight is personal” caps. Ok, I love them all! I purchased several of the LIVESTRONG collection, a few for myself and a few as gifts for friends (I haven’t given those yet so you won’t see those pictured here!). If you haven’t purchased from StemCaps in the past, you will need to purchase a base. 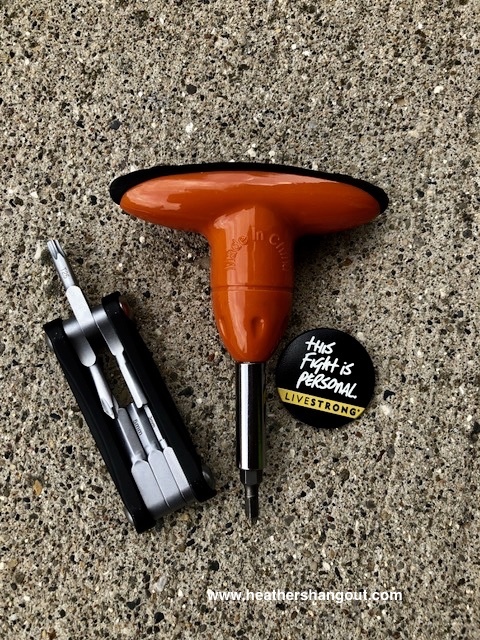 This is similar to your bike’s standard stem but designed to fit the custom cap. Once you install the StemCap base, it is used for any of their caps. I found the stem cap base and cap really easy to install (thankfully because sometimes Specialized makes their bikes ‘special’ with regard to torque sizes, what fits, etc). And there are easy instructions included (I know, I know, yes, I actually read instructions. And I stop to ask for directions. Calm down.). With an easy install and tightening, the base was ready for my new stem cap. I just couldn’t decide which cap Ruby should show off first! I finally decided on the awesome survivor cap. Easy to install with a few tools. On a side note, curiosity had me wondering how easy it is to remove/switch the caps. I got the cap off with little effort. Overall, I think these are a meaningful way to support someone facing cancer (yourself included!) or honor someone’s memory, and support a great organization that helps people facing cancer. And your bike will look cool. Win-win-win for all! Don’t have a bike or don’t want to switch out your stem cap, but still want to support LIVESTRONG through these cool designs? No worries, there is a magnet option! A magnet base lets you add a cap to display on your refrigerator or wherever. Another great gift option too. 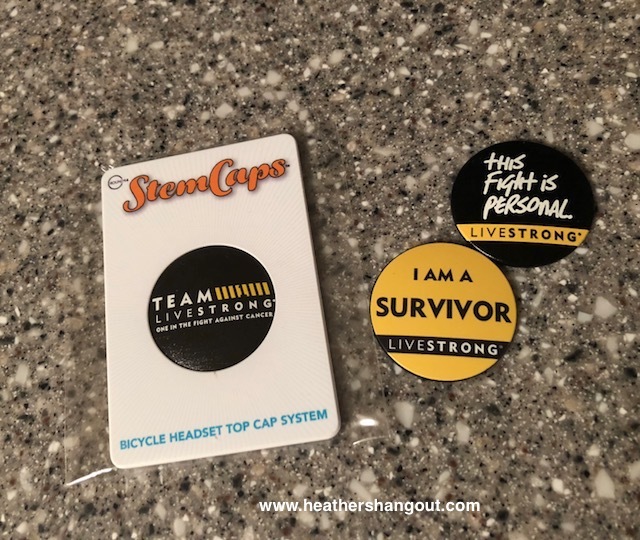 Check out the StemCaps options that support LIVESTRONG and bring some fun to your bike while also helping people with cancer. *This post is my opinion and all StemCaps were purchased by me. I simply think these are a cool opportunity to support a great nonprofit!